The mirror is an interesting thing. It shows us what we look like- not what we imagine we look like, and not the image of ourselves we necessarily want to have, but what we actually look like. This can be an unsettling experience for some people, especially when catching an unexpected reflection and especially in ancient cultures where things like mirrors were not common place. 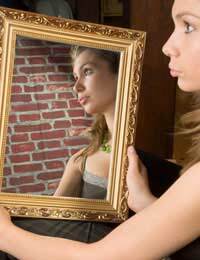 Thus many superstitions and wives' tales have sprung up involving mirrors, ranging from the creepy to the mundane to the ones serving as preventative medicine—designed to protect a very reflective, very expensive investment. Breaking a mirror is supposed to bring with it bad luck; and not just regular old bad luck, but the kind that persists for seven years. One could just imagine the lady of a house cringing as her rambunctious brood careened down a hallway, bumping into an ornate mirror that represented more than the annual household income, and screeching a warning to the children of the woes that would dodge them for seven years should they actually cause the mirror’s destruction. The other origin was simply as a scare tactic. Mirrors were not cheap, especially not high quality, defect-free mirrors that are taken for granted today. In olden times those mirrors came at a dear price, and it was a handy mechanism to attribute seven years of bad luck to their destruction. Perhaps the youth were impressed that their parents cared enough to help them avoid so much bad luck, or perhaps they were just left with the impression that if they busted the mirror they were in for a world of hurt—either way the idea caught on. But what does the luckless do if they accidentally break a mirror? The only way to avoid the curse is to take all the pieces of the mirror and bury them in the moonlight. I was wondering. What would happen if you snap your fingers in front of a mirror. Would you become someone that is completely opposite of you. From a different world or timeline. It's the same person. same name but different personalities. Like for example Say your a really nice person. You snap in front of a mirror And you become a evil version of yourself while the good version of you is trapped in the mirror. I glanced in the mirror at a distance as I was leaving! To my surprise seen my soon to be ex-wife that i havnt seen I nearly 2 months. What does that mean? It is said that when someone dies, mirrors in the house must be covered so that the soul of the departed does not get trapped in the mirror [portal to another world]. MY MOTHER ONCE TOLD ME THAT IF SOMEONE DIED IN THE HOME AND THE MIRROR WAS NOT COVERED UP THE MIRROR WOULD TURNBLACK SO WHEN MY DAUGHTER, MAKEBA DIED IN THE HOME ABOUT THREE DAYS LATER MYTHREE RINGED MIRROR DID TURN BLACK.